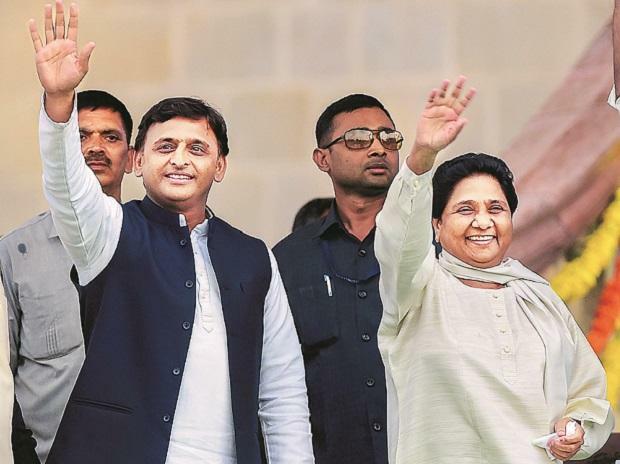 The Samajwadi Party and the Bahujan Samaj Party have agreed to an alliance in Uttar Pradesh ahead of the Lok Sabha elections, an SP leader said Saturday. A formal announcement on the "gathbandhan" between the two opposition parties may take place later this month, SP's national spokesperson Rajendra Chaudhary told PTI. There is no official word yet if the Congress too would be part of the UP alliance. The state BJP called the development “opportunistic” and “anti-people”. Chaudhary said Samajwadi Party president Akhilesh Yadav and BSP chief Mayawati had given their go-ahead for the alliance after a series of meetings between them. "There has been an in-principle approval for the gathbandhan. And there is a possibility that an announcement in this regard will be made this month," Chaudhary said. "A number of meetings between SP chief Akhilesh Yadav and BSP supremo Mayawati have already been held. Yesterday too, both leaders met in Delhi," he said "Talks are going on to accommodate some smaller parties in the alliance," he said. He admitted that the Rashtriya Lok Dal (RLD), which has a presence in western UP, is among these parties. When asked about the possible inclusion of Congress in the UP alliance, Chaudhary said, "This will be decided by Akhilesh Yadav and Mayawati." But he added the SP and the BSP will not field candidates in Amethi and Raebareli, leaving these Lok Sabha constituencies for Congress president Rahul Gandhi and United Progressive Alliance chief Sonia Gandhi. UP Congress chief Raj Babbar argued there had been no announcement after the meeting between the presidents of the two parties, and it was not for him to comment on it. "We are yet to get any instructions or directions from our central leadership," he told PTI. Akhilesh Yadav had recently expressed displeasure against the Congress for not including its lone MLA in the new Madhya Pradesh ministry headed by Kamal Nath. BSP leader Mayawati too has said it may withdraw its outside support to the Congress in Madhya Pradesh and Rajasthan if the cases against Dalits lodged during a protest last year are not withdrawn. The BJP dubbed the coming closer of the SP and the BSP “opportunistic”. "This is an opportunistic alliance and it is completely anti-people. The BJP will register massive wins in UP in the 2019 Lok Sabha elections," UP BJP spokesperson Hero Bajpai told reporters here. The opposition parties defeated the ruling Bharatiya Janata Party in three Lok Sabha bypolls in the state last year. In the Kairana Lok Sabha by-elections in May, the BJP lost to the joint opposition candidate, RLD's Tabassum Hasan. The seat had fallen vacant following the death of the BJP candidate Mriganka Singh's father Hukum Singh. Tabassum Hasan was supported by the Congress, the SP and the BSP. In March, the BJP lost the Lok Sabha bypolls in Gorakhpur and Phulpur. In the last parliamentary elections in 2014, the BJP won 71 seats in the state, securing 42.63 per cent of the votes. BJP ally Apna Dal bagged two more. Congress registered wins on two UP seats in 2014, bagging 7.53 per cent of the votes.